The EFIS-D10A is an STC’d replacement for the failure prone attitude indicator in type certificated GA aircraft. Initial STC covers Cessna 150, 152, 172 and Piper PA-28 and PA-38 models. More aircraft approvals expected. Proven in thousands of Experimental and LSA aircraft over 10+ years. Details about pricing and availability to follow. Over 15,000 experimental and LSA aircraft already fly with Dynon glass panel products. Based on this success, the EAA, FAA, and Dynon partnered to gain FAA approval for the installation of Dynon’s EFIS-D10A in type certificated GA aircraft. The Dynon EFIS-D10A is the first product to be STC approved. The EFIS-D10A is a full 4” Primary Flight Display that includes attitude, airspeed, altimeter, magnetic heading, turn rate, inclinometer, g-meter, winds, and more. Other capabilities include Angle-of-Attack and internal backup battery. The initial STC allows the EFIS-D10A to replace the existing primary attitude indicator in Cessna 150, 152, 172 and Piper PA-28 and PA-38 series aircraft with a modern EFIS that contains no moving parts. More aircraft approvals are expected to follow. Based on demand, Dynon also will design turnkey installation kits for installers that include aircraft-specific panels and mounting equipment. The STC will be available for a nominal price from the EAA. 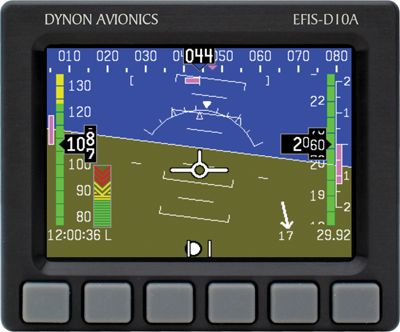 Dynon will sell the EFIS D10A and installation kits for STC installation through selected dealers. Unique to this STC, EAA, Dynon, and the FAA worked together to allow the EFIS-D10A to be installed without the traditional Technical Standard Order (TSO) or Parts Manufacturer Approval (PMA) requirement. Dynon’s product is also verified against the recently developed ASTM 3153-15, Standard Specification for verification of Avionics Systems. The EFIS-D10A was flight tested in Oshkosh earlier this year in an EAA Cessna 172M. The cost and application process for the STC will be finalized in the coming weeks by EAA. Pricing and availability of Dynon’s EFIS-D10A for this STC will also be available in the coming weeks. Visit the EFIS-D10A STC web page for more information. Download the EFIS-D10A media kit.